The ATLAS Maximum Demand Control System works intelligently to control a site's period demand level to preset limits. For those wanting a simpler load control capability, the DIN rail mountable 'B867' Over-Current Protection Unit may be suitable. The ATLAS Maximum Demand Control System operates on a predictive basis to control a site's electrical period demand (kW or kVA) to within user set target levels. Control targets can be set to keep a site within contracted supply capacity limits, to meet Electricity Demand Reduction (EDR) Scheme or Demand Side Management (DSM) requirements. Maximum Demand Control based on prediction of period demand. 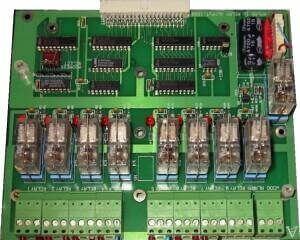 Eight load shedding control relays. Target demand limit set independently for each 1/2 hour period of each day. Selectable relay shed & restore sequence. Shed & restore hysteresis to account for load start up values. Control site demand to Supply Capacity, Electricity Demand Reduction Scheme or Demand Side Management limits. Electricity meters provide usage information in the form of consumption pulses. For example, the meter may send a pulse after each 10 kWh of energy is consumed. 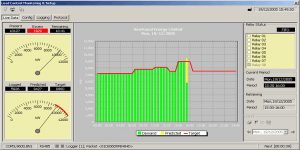 The Load Control logger collects these consumption pulses & calculates a prediction of the Period Demand. If the predicted period demand exceeds the preset target level, any of 8 control relays will be activated. The target period demand level and other control parameters are set via the ATLAS Maximum Demand Control & Demand Side Management system software. The well proven Atlas IV logger uses consumption pulse signals from the site electricity meter in order to calculate the Present Load (typically in kW or KVA). 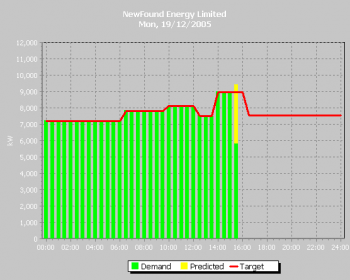 It then uses the present load along with the known consumption so far in the present period to predict the Period Demand (in effect the average kW or kVA load over the 30 minute period). 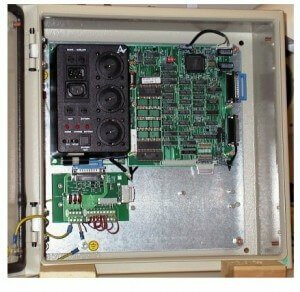 To the capabilities of the ATLAS IV Energy Monitoring Logger is added the Load Control Unit (LCU). The LCU houses the 8 load shedding relays that will be activated when a predicted breach of the target period demand level occurs. 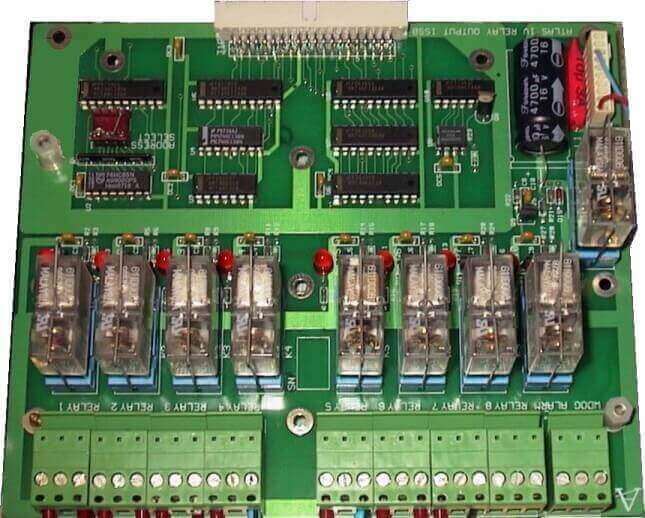 The Load Control Unit relays can be used (via an appropriate contactor or PLC if necessary) to switch on warning lights or alarms, disable non essential loads or decrease the load drawn by production machinery (via a furnace control system for example). 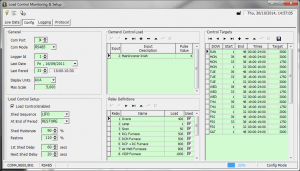 Through the ATLAS Maximum Demand Control Software, the demand control parameters are specified before being uploaded to the ATLAS Load Control Logger. 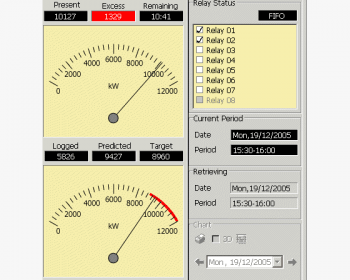 Once configured, the ATLAS Load Control Logger operates independently of the system software to keep you within your Supply Capacity, Electricity Demand Scheme or Demand Side Management limits. The LCU continuously monitors the predicted demand level and activates the control relays as necessary when a breach of the target demand is predicted. 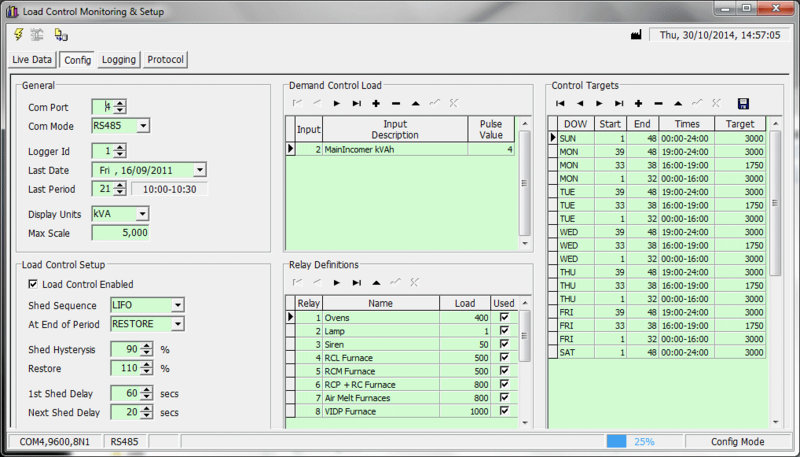 The ATLAS Demand Control system software can be left permanently running as a visual display of demand level or simply used as necessary to update the control parameters. For those requiring a simple automated load control device, the DIN rail mountable B867 over current protection unit may be suitable. 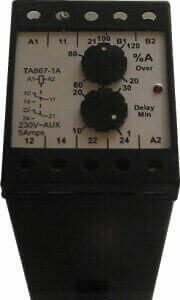 Available in single or three phase versions, the B867 over-current device continuously monitors the AC current either directly (up to 5A) or via current transformers (for circuit currents >5A) and trips an internal relay when a preset current limit is breached. 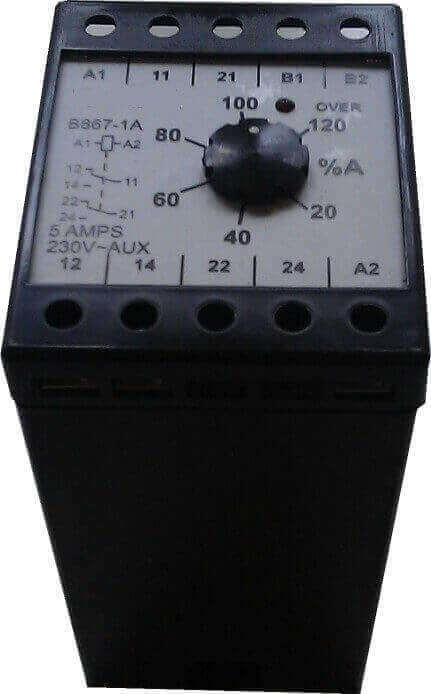 The load limit is set via a simple dial to a percentage (between 20% & 120%) of the nominal current. For example, if 100/5A CTs are used, the load limit may be set between 20% and 120% of 100A. DIN rail mounted Over Current Protection. Load limit set to between 20% to 120% of nominal current. Single and three phase versions available. Operating time 2.5s at 2% over current limit but 0.1s if load hits 200% of limit. 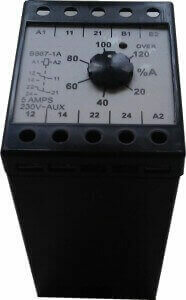 Single pole change over relay output (double pole option on single phase). 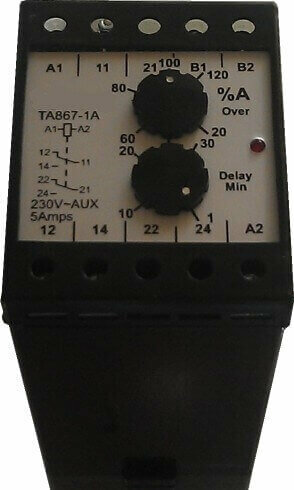 Optional 'release' timer prevents reinstatement of tripped relay for set period.